This small, jungle topped island is located on the way to Shark Point from Phuket and is considered one of the best wall dives in the area. 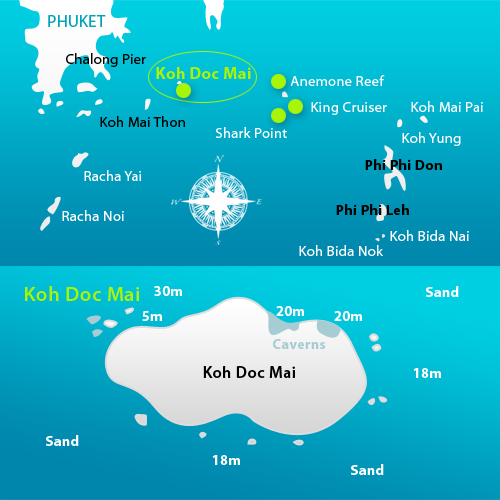 Doc Mai is a huge limestone rock that rises steeply out of the sea. On three sides the sheer walls occupied with a different creature in every nook and cranny drop straight down to the sea floor. 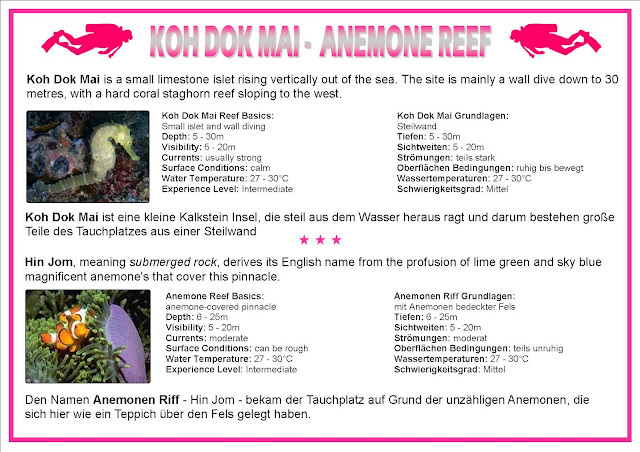 The west side is a gently sloping hard coral reef with an abundance of colorful sea life decorating its underwater cliffs. This dive is noted for its variety of reef fish and an opportunity to view some of the resident Moray Eels. This spot is very good for underwater macro photography with good chances to spot a yellow tiger-tail Seahorse, ornate and harlequin ghost pipefish. On the sandy bottom you may find a Leopard Shark sleeping or even a grey Reef Shark or Bamboo Shark. The coral is superb and very colorful. The east-side of the island is a virtual garden of yellow tube corals and you can explore some of the small caves along the base of the wall. 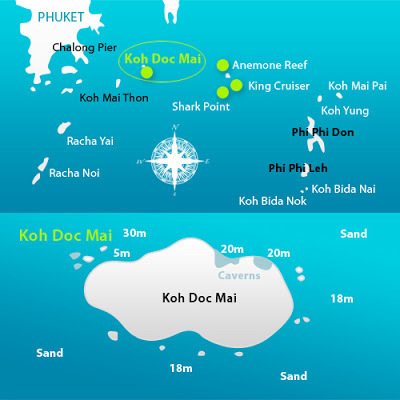 This is a fairly short dive as you can easily swim around the entire island, and it is included on many on day-trips to Shark Point and Anemone Reef.